In 2010 and 2011, I was writing the Kulturträger column for Alternatives Journal. Here are those columns. What is a kulturträger you ask? Kulturträger is a german word that roughly means bearer of culture. The idea that motivated the column was that enduring ecological sustainability will require cultural changes to support the technological, economic, political, and social changes that are also needed. What those cultural changes will look like and how they will happen are hard to predict. But, we cannot expect them to happen automatically. It is common to think of culture as something that simply “evolves” on its own, as if independent from individuals. However, it is actually through the collective influence of peoples’ cultural expressions (some more than others) in conjunction with economic, political, technological, social, and ecological forces that cultures change. So I wanted to write about some of those ways that people are working to nudge our current culture of consumption and ecological imperialism towards something that supports sufficiency, justice, and ecological reciprocity. Those people are kulturträgers for a new paradigm of ecological sustainability. Mark Meisner “And Now For Something Completely Different,” Alternatives Journal Vol.37, No.6, 2011. Mark Meisner “Ready-to-Care: Green fashionistas Emma Watson and Summer Rayne Oakes are helping the culture of couture find its conscience, without sacrificing style,” Alternatives Journal Vol.37, No.5, 2011. Mark Meisner “Miami’s Vice: Florida may be leading America’s slide into ignorance, weirdness and triviality, but it’s a fine comic target for Carl Hiaasen,” Alternatives Journal Vol.37, No.4, 2011. Mark Meisner “The Doctor Knows Best: The BBC’s much-loved sci-fi series, Doctor Who, offers lessons in celebrating and defending all life,” Alternatives Journal Vol.37, No.2, 2011. Mark Meisner “Beware False Idles: Ads for cars now show them in tune with nature instead of conquering it, but either way, the car is a dubious environmental hero,” Alternatives Journal Vol.37, No.1, 2011. Mark Meisner “Getting Down and Dirty: Dirtgirlworld offers little kids a funky rockin’ organic alternative to talking machines and consumer-oriented TV,” Alternatives Journal Vol.36, No.6, 2010. Mark Meisner “Documentary Exploits: This year’s Oscar winner, The Cove, is part of Flipper-trainer Ric O’Barry’s effort to expose the underbelly of animal stardom,” Alternatives Journal Vol.36, No.4, 2010. Mark Meisner “Travelogues with Conviction: There is more than one way to reach paradise,” Alternatives Journal Vol.36, No.2, 2010. 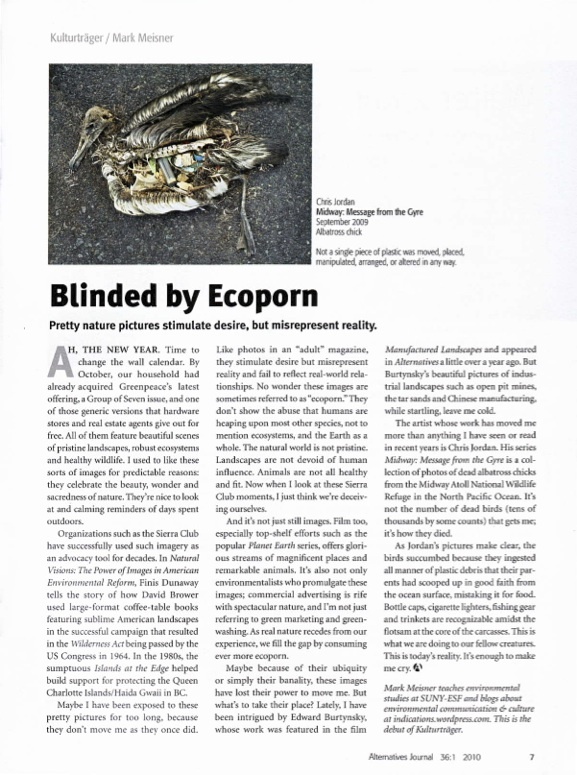 Mark Meisner “Blinded by EcoPorn: Pretty nature pictures stimulate desire, but misrepresent reality,” Alternatives Journal Vol.36, No.1, 2010.